The tour organizers planned in a rest day. As long as we were resting, we might as well be sightseeing! Everyone on the tour had to choose one of three routes through the park (short, medium, or long) and a departure time. Bugman and I chose the 6:30 am “grand tour” departure. 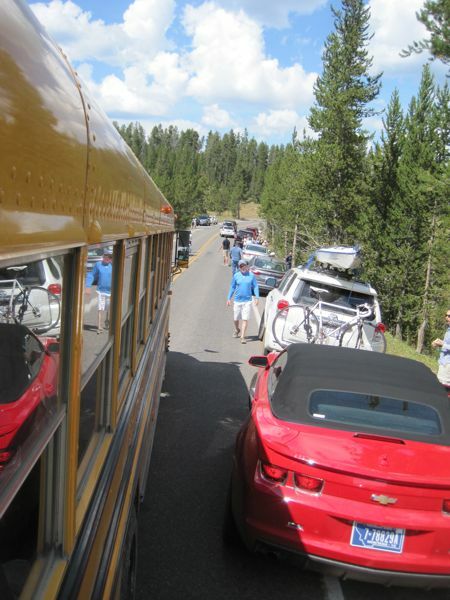 All of the tours were in school buses (there were not enough charter buses in the area to accommodate our entire group), so I was glad there were plentiful restrooms in Yellowstone. 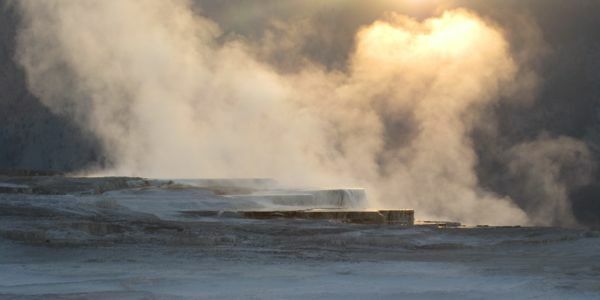 Sunrise at Mammoth Hot Springs. Aw. There’s a heart in the steam. That’s for you, dear Bugman. 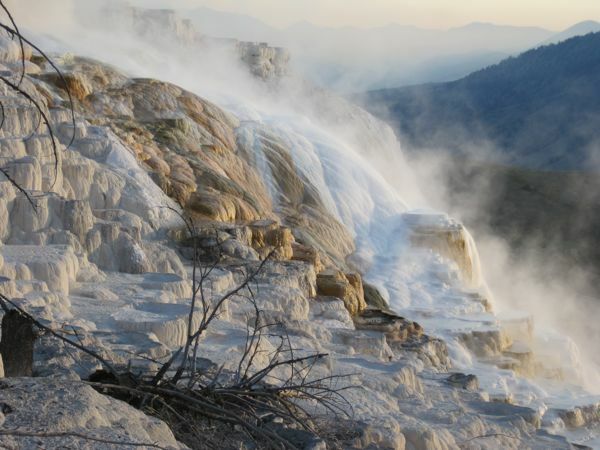 Mammoth Hot Springs is such a bizarre place. 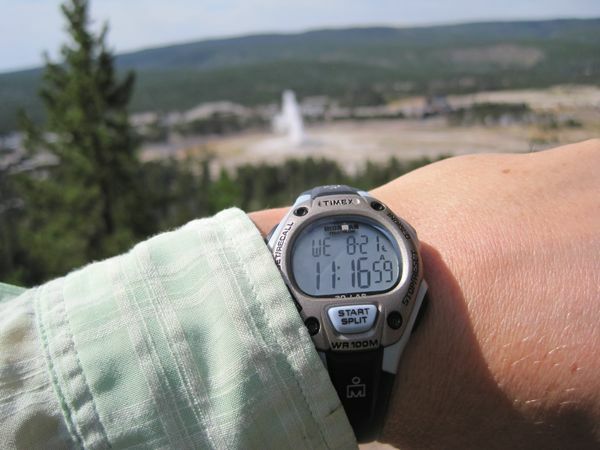 Much of Yellowstone is bizarre, actually. I can see how the first reports of the place were disbelieved and compared to Xanadu in Samuel Taylor Coleridge’s Kubla Khan poem. 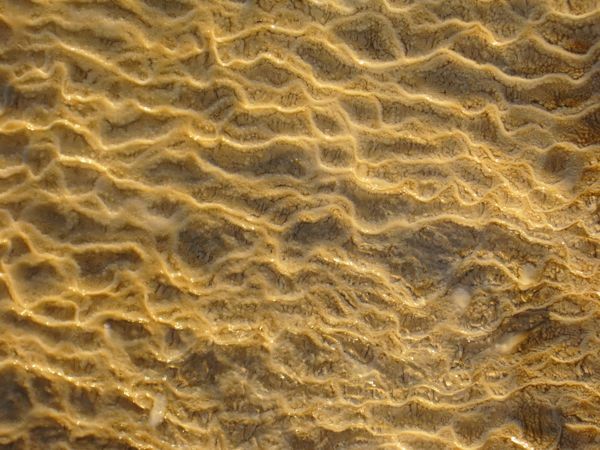 The travertine limestone accretions, tinted by various colonies of microorganisms, are fascinating. I could have studied them for hours. 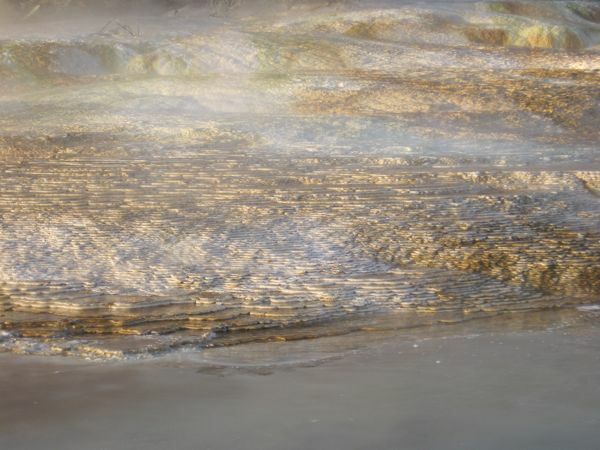 Closeup of “live” hot springs travertine limestone. Next stop: Porcelain Basin. I included the boardwalk with people on it in this photo for scale. This is an intensely weird place. 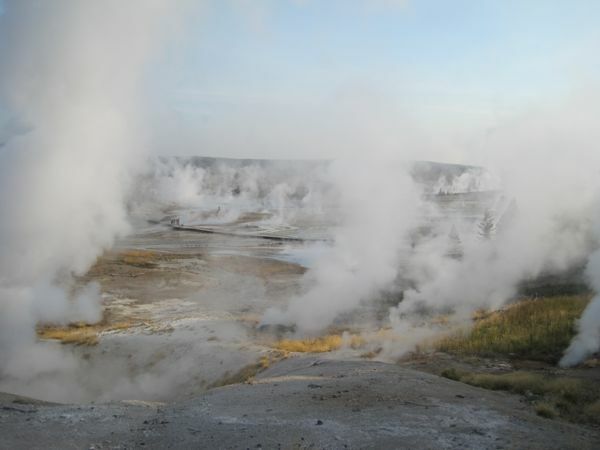 Everywhere you could hear the hiss and bubble of fumaroles. 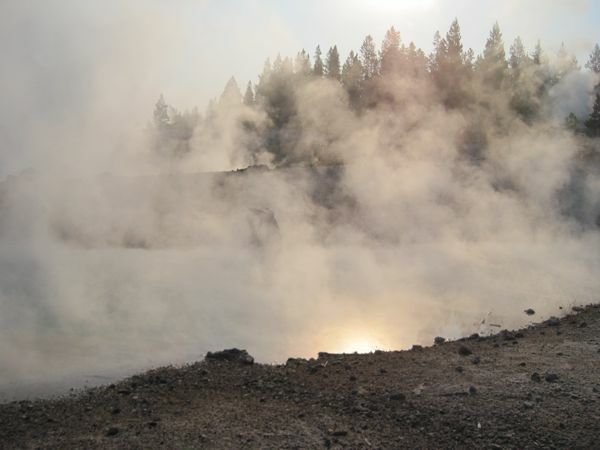 The Norris Geyser Basin is another good place to be early in the morning. Finally! 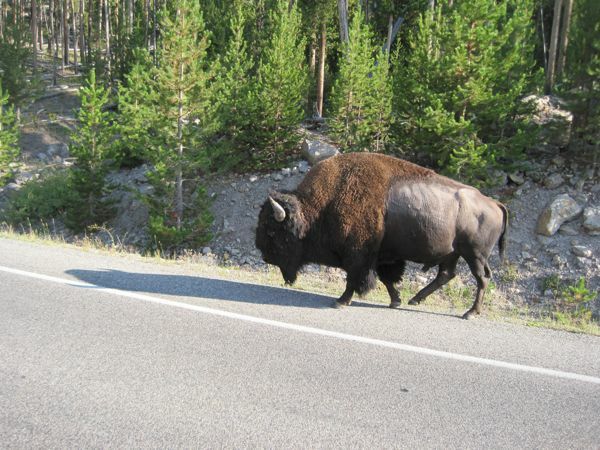 The “bison on road” signs are justified! 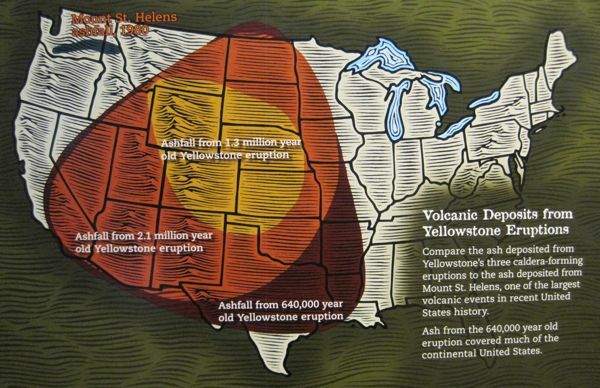 At the Old Faithful visitor center was a map I had searched for in vain some years ago for a blog post pointing out that Nebraska is doomed if the Yellowstone caldera blows again. And a thousand camera shutters clicked . . . 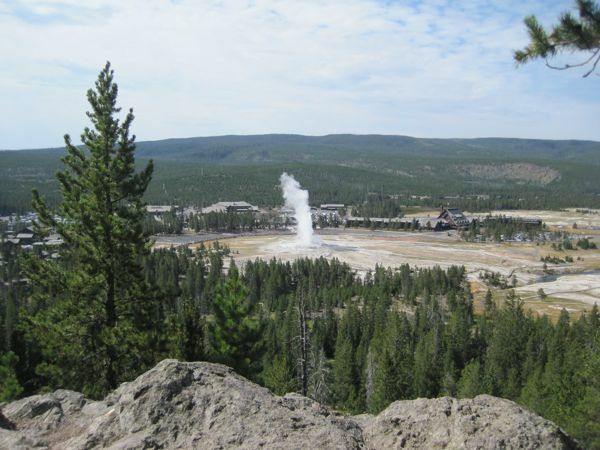 The spectacle of all those humans gathered to witness this famous geological phenomenon was interesting to me, as was the fact that the crowd applauded after the eruption. When we heard the applause, Bugman and I began to run. We had about 15 minutes to cover the 1.5 miles or so back to the bus. 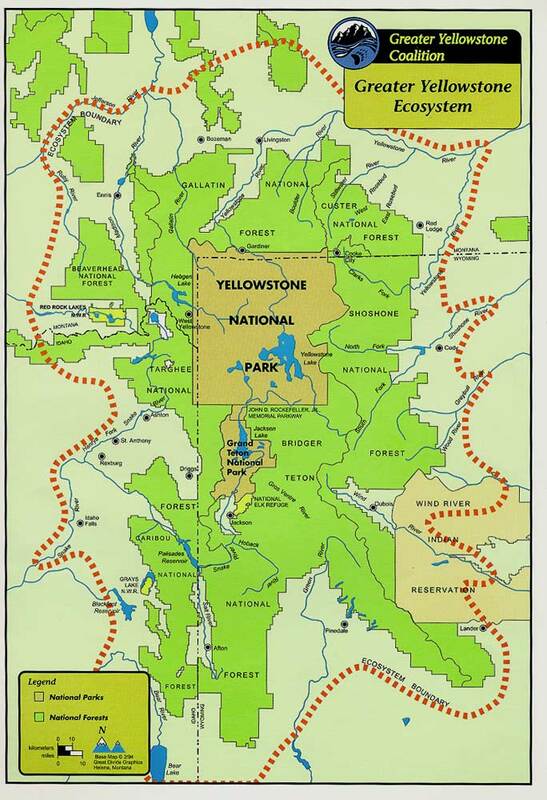 Next stop: Grand Canyon of Yellowstone. Hot tip: walk a few dozen meters off the paved trail into the “backcountry” and you’ll get great views without the crowds. Outside some visitors center whose name I cannot recall, information about area wildfires was posted. 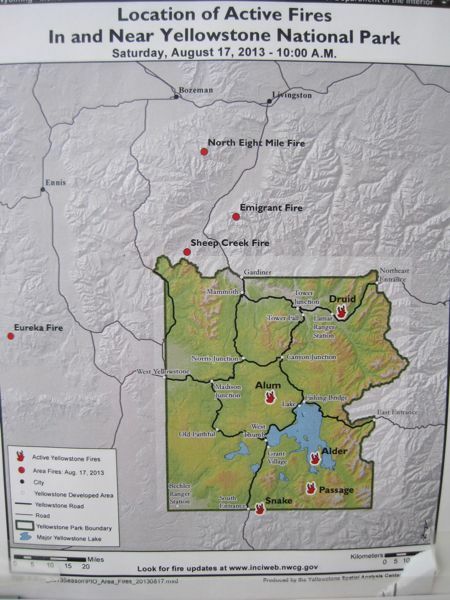 The postings also mentioned that Beartooth Pass was closed due to a fire . . . we were supposed to ride Beartooth in three days . . . When we got back to camp, we wandered in the rain to consult with tour officials, bike mechanics, and shipping truck staff to figure out how we were going to get ourselves and our bike to Cody the next day, since we would not be riding. A volunteer from Bozeman had room in her car and offered to give us a ride. (Thanks, Shannon!) The jovial-yet-no-nonsense guy from High Country Shipping gladly offered to hang our bike from the rafters of the baggage truck right then so it would arrive in Cody the next morning. All we’d have to do the next day would be to pick up our rim and get our bike repaired. 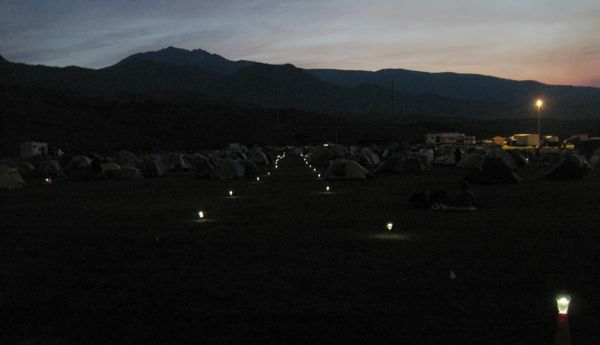 Announcements were interesting that night, as we were told that the wildland firefighters had co-opted our campsite in Red Lodge and that we would not be riding Beartooth Pass on Saturday. 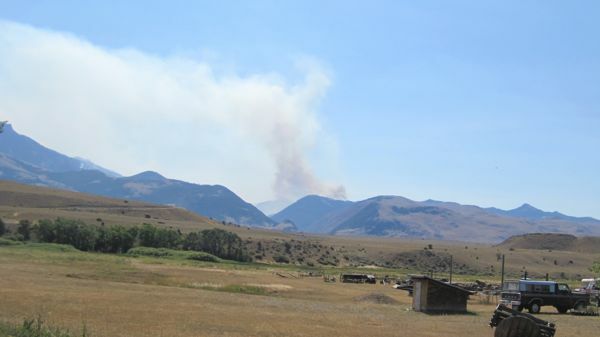 The All American Beartooth HIghway 212 that goes through Beartooth Pass is closed south of Red Lodge as the Rock Creek Fire grows to 700 acres. 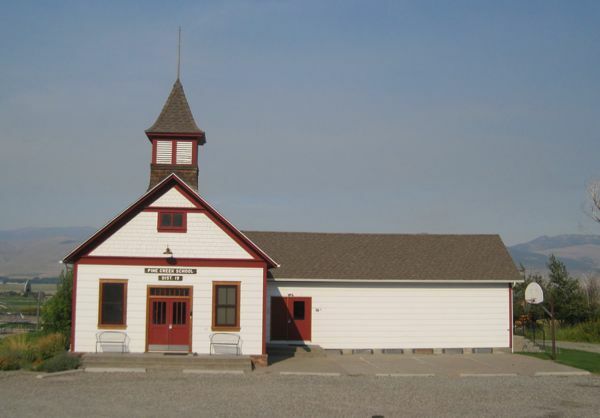 The Board of the Red Lodge Area Chamber invited speakers and the Carbon County Commissioners to discuss the event at their meeting at The Pollard on Wednesday, Aug. 21. 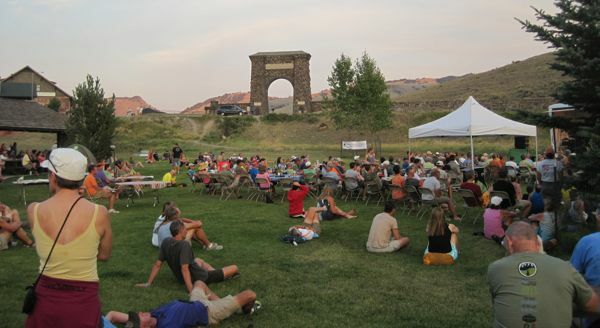 “Can the pass open for the bicyclers on Saturday?” asked Angela Beaumont, board member referring to the upcoming Cycle Greater Yellowstone event. “Not happening,” said USFS Fire Information Office Jeff Gildehaus. 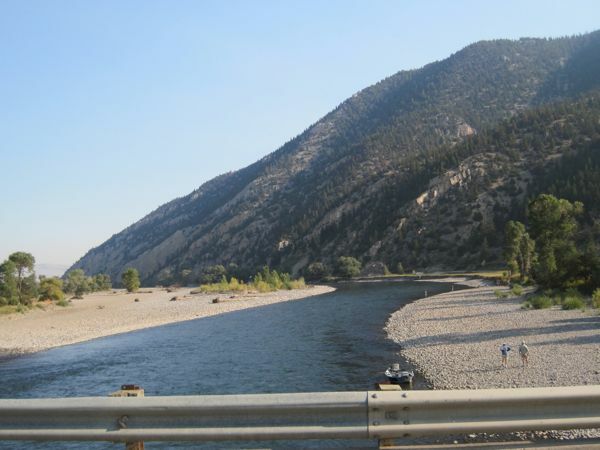 “If there is fire near the road or firefighters working on the road – it’s not safe.” He said he had just spoken with Montana DNRC Director Matt Wolcott and they felt 700 cyclers in the pass was an unacceptable risk. Since we knew we would not be riding the next day, and because of the disappointing news, we decided to take the signs to heart. 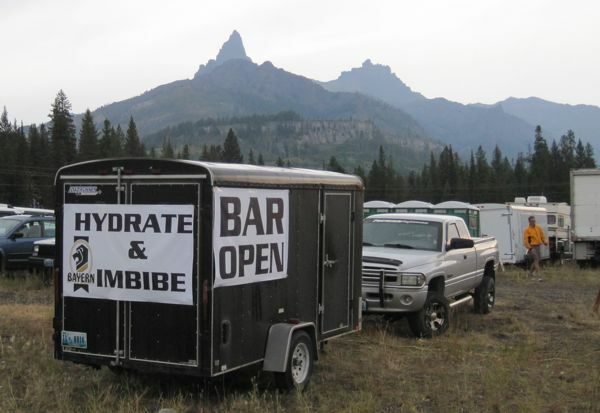 We “hydrated and imbibed” under Pilot Peak. We started the morning with a visit to the mechanic tent to get those obviously loose spokes tightened up. Spokes should not wiggle easily back and forth – especially less than a week after having been retensioned! The mechanic didn’t have a spoke tensiometer on him, so he gave it his best guess, taking care not to overtension the spokes, and at least got the spokes to the point where they didn’t rattle and the wheel to the point where it was nice and true again. I plucked the spokes like harp strings, and they all sounded pretty much the same – plink, plink, plink, plink – except for one spoke on that pesky back wheel that the mechanic could not get to tighten – plunk! 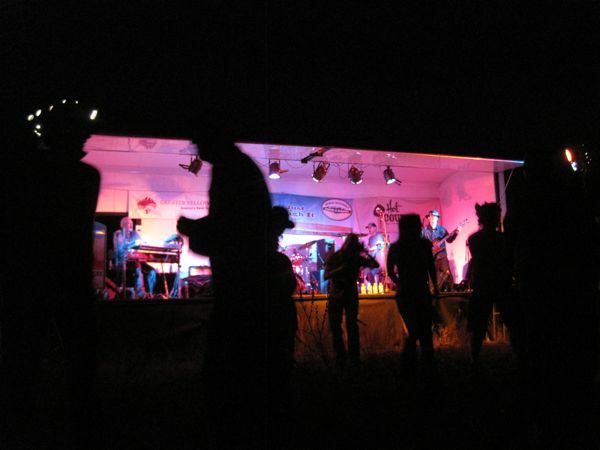 We had discovered loose spokes on a 94-mile ride back home just before we got the wheel trued and didn’t seem to have any problems, so we figured the job would be good enough to get us through, and we’d stop back by the mechanic’s tent that evening to have the spokes checked again. This is the bridge over the Yellowstone River in Paradise Valley – a very beautiful place where we almost clocked a fellow cyclist who, along with many other cyclists, had dismounted on the bridge to take pictures but, unlike the other cyclists, had failed to look for traffic before she walked out into the road. Another advantage of the tandem: I don’t have to watch the road or steer, so I can take all these pictures from the back of the bike without risking getting clocked by traffic. Paradise Valley was pretty smoky that day from the Emigrant wildfire. The night before at announcements, the ride organizers had checked the forecasts and said that smoke would likely be “moderate” and would not bother most people, but if anyone was concerned, there would be a physician available in the morning to see patients and prescribe inhalers if needed. Have I mentioned that this ride was well organized?? These folks thought of everything! Bikes on the road in Paradise Valley. I’m sure a lot of locals knew about the ride and were expecting to see cyclists, but I wonder what the uninformed thought when encountering miles of cyclists along the road. Side note: some of the fanciful ranch names in Paradise Valley: Jumping Rainbow, Dancing Wind, Paradise Found, Imagine Ranch. Lunch stop at River’s Edge Bar & Grill in Emigrant. After lunch we were far enough south to be upwind of the Emigrant fire – no more breathing smoke. Rest stop on Montana DOT land. We crossed onto Gallatin National Forest land (Paradise Valley is a narrow private-property “V” into the national forest) and were met with a “bison on road” caution sign. Didn’t see any bison, but the scenery was beautiful. We rolled into Gardiner around 3 pm. While everyone else was lining up their bikes to be loaded up for shipment to our next campsite after our rest day and bus tour of Yellowstone the following day, we and headed for the mechanic tent to have our loose spoke checked on. As a mechanic approached and I bent down to show her the problem, I noticed – OH NO!! – a crack in our rear wheel rim at the loose spoke! And we’ve got that fancy-schmancy Rohloff hub. No at-hand replacements for us! Cracked rim! Dun dun duuuuuun…. We talked through our options with the head mechanic. The next day was a rest day, so we had a day to get things done without cutting into the ride. 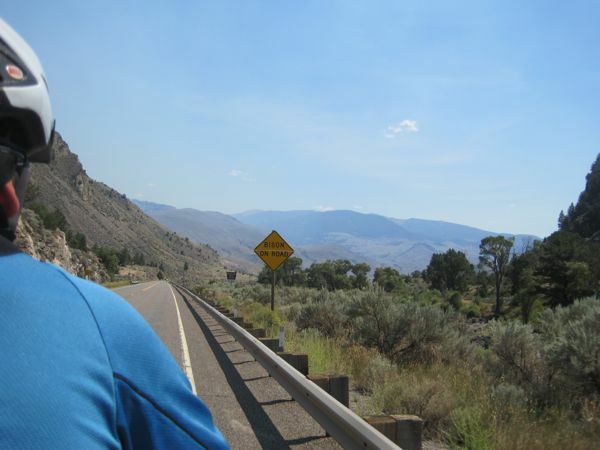 If our future rides were like today’s ride – 56 miles and no serious hills – we could probably ride the cracked rim a bit longer. 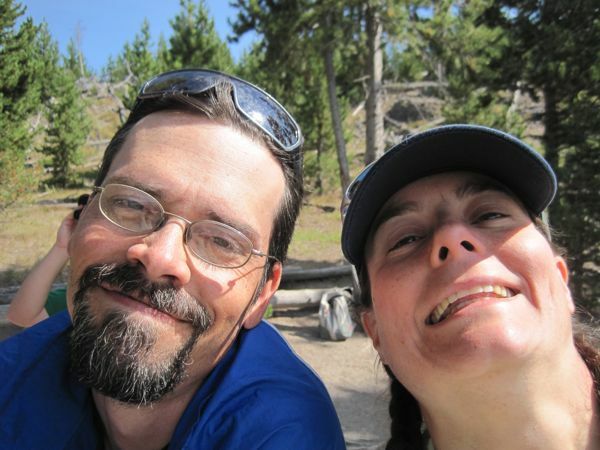 But the scheduled ride in two days was through from Pilot Creek to Cody via Chief Joseph Pass (6 miles of 5 percent grade followed by a helluva descent that could really get a tandem rolling fast). That would not be safe to ride on a cracked rim. We’d have to get things fixed. We got our bike in March, so it was less than 6 months old and had less than 700 miles on it by this point, so the bike would still be under warranty. We tried calling the bike shop in Denver where we purchased the bike. It was Tuesday. They were closed. Next, we spent several frustrating minutes trying to look up the bike manufacturer’s phone number via a barely-there cellphone Internet connection. We found the number and got through to a live person right away. I explained our dilemma and directed my attention back and forth between the bike mechanic’s suggestions as he thought things through and the bike company guy. 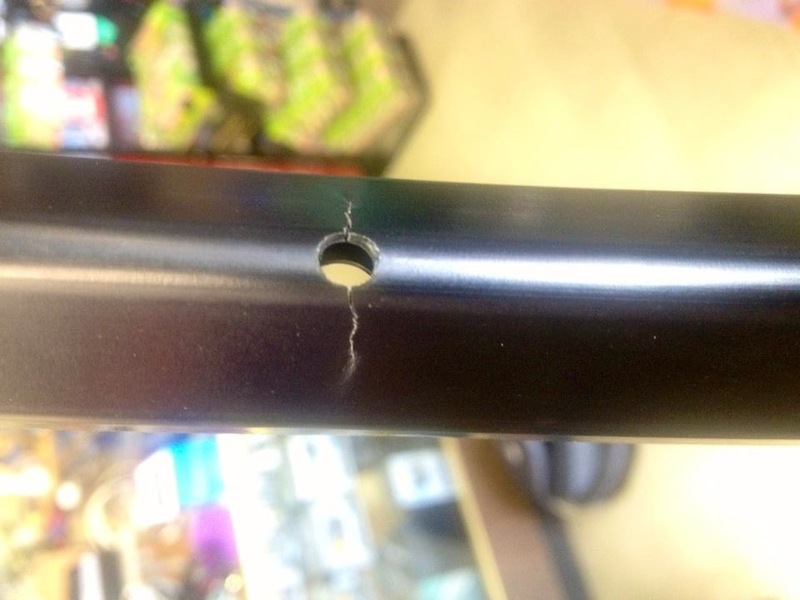 Could we have a rim overnighted to a bike shop in the Silver Gate / Cooke City area, our next stop? Probably not a good idea. 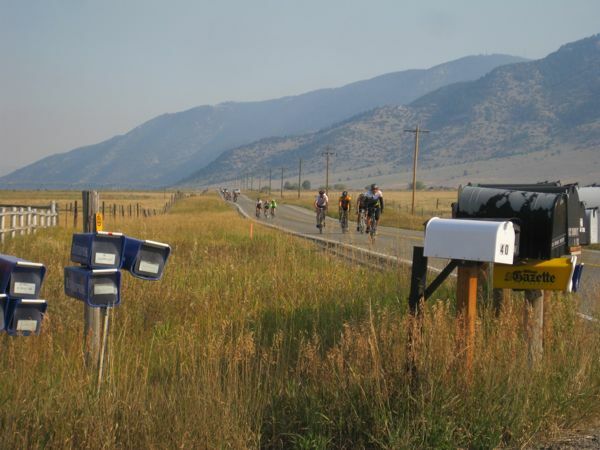 It’s rural Montana, the delivery might not make it even if overnighted, and the mechanics had not been able to contact a bike shop in that area. 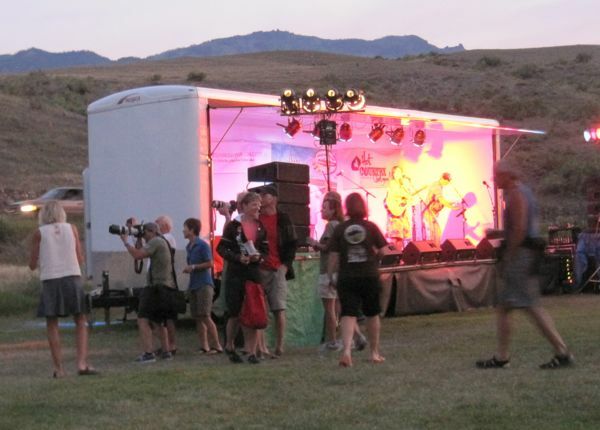 How about 2-day shipping to the bike shop in Cody? It would mean we would miss a day’s riding – purportedly the most beautiful day to ride. But 2-day shipping was a more reasonable cost, and we would be responsible for covering the difference in cost between regular and expedited shipping for the warrantied rim replacement. There had been solid contact with the shop in Cody. We could pick up the rim and have the mechanics rebuild the rear wheel in the evening at camp. Was there still time to make the UPS pickup at the bike manufacturer in Oregon? Yes. We still had 30 minutes. I gave the bike manufacturer guy my credit card number to cover the cost of the shipping, and that was all we could do for the time being. We added our bike to the line to be packed up and transported to the next camp and went about our business. 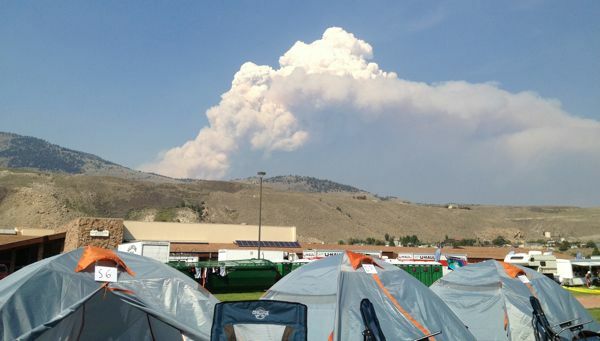 View of wildfire smoke from our tent in Gardiner. It was interesting to note how the smoke “pulsed” over 24 hours – dying back at night and flaring up again with the heat of day. 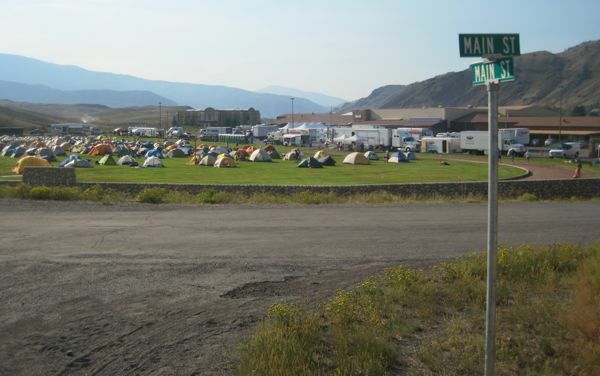 After we got cleaned up, we left our campsite on the Gardiner school football field, at the corner of Main Street and Main Street (?? ), to run some errands. The Gardiner laundromat is probably the cleanest one I have ever been in. 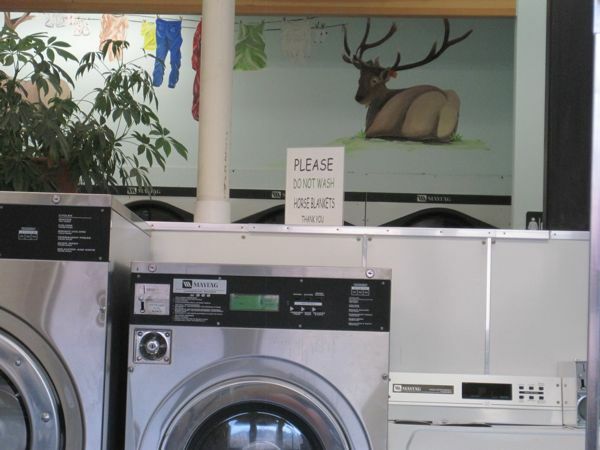 Just please don’t wash your horse blankets there. While we were waiting for the laundry to be done, we decided to go find a beer. We walked into the Two Bit Saloon only to walk out again a few minutes later after the bartender got into a loud argument with a patron. Oookaaaayyyyy…Walked to the Blue Goose Saloon, but there was heavy metal music blasting inside. Not our scene. We settled for ice cream cones instead. 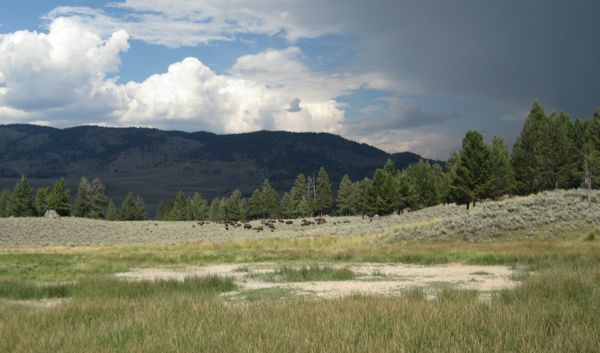 While we were sitting outside the shop eating the ice cream and looking out over the Yellowstone National Park fence, we spotted our first megafauna. 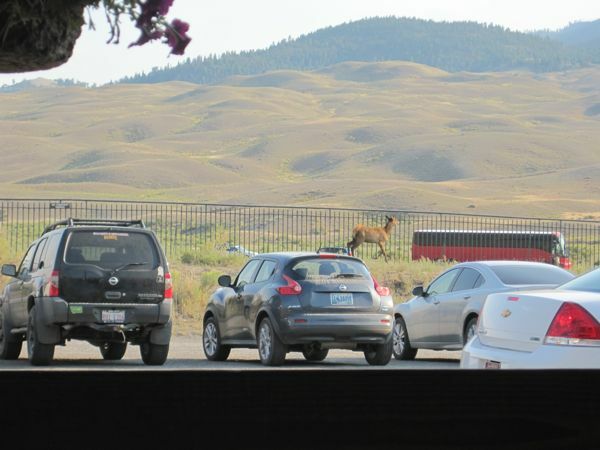 A slightly lost elk on the wrong side of the fence. 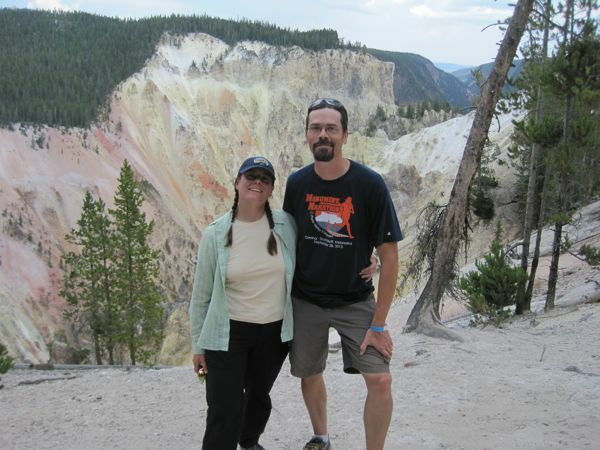 I guess I hadn’t realized that the community we were in was literally at the gate of Yellowstone. 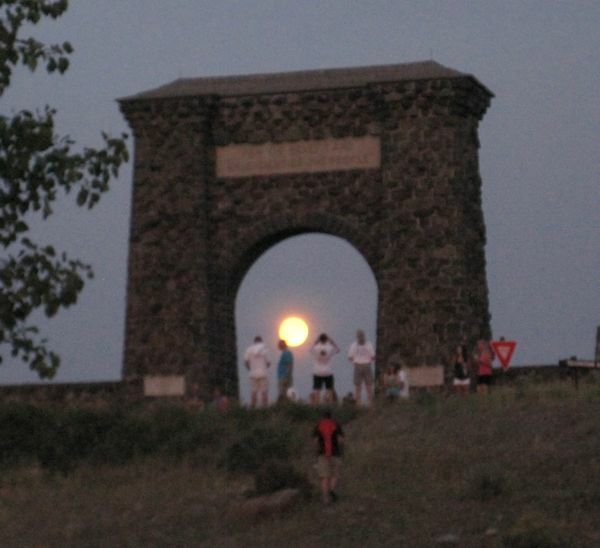 Our evening announcements in Gardiner featured the Roosevelt Arch in the background. 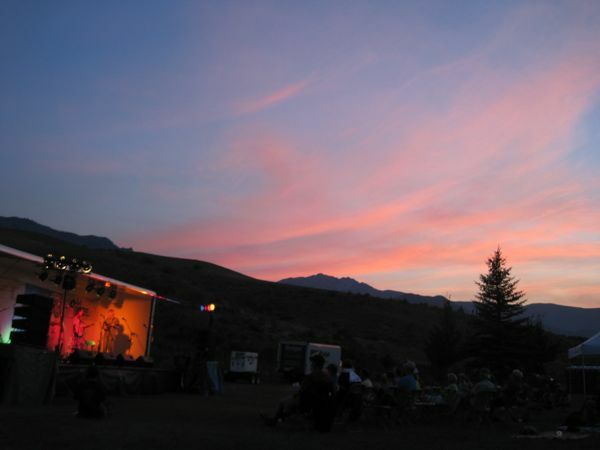 Sunset concert in Gardiner – with Little Jane & the Pistol Whips. A few minutes later, Bugman pointed out the ride’s professional photographer focusing his lens towards the gate. Full moon perfectly framed! Full moon framed by the Roosevelt Arch, as interpreted by my point-and-shoot camera. Soon there was a photography scrum at the stage. The wine tent in Gardiner sure was pretty. 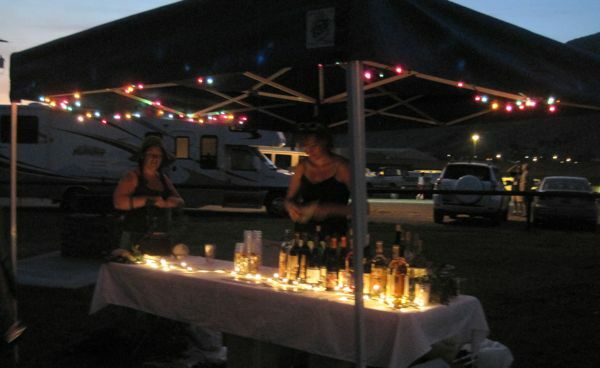 I loved how different local wines and beers were featured at our campsite concerts.